Here's a chorus of blues in F with some of the chord voicings from the Freddie Green Lessons from April. 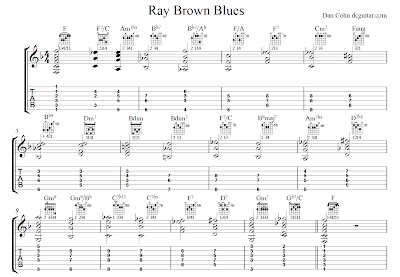 For some reason, playing a blues with two beats to the bar as opposed to the four beats of a walking bass line makes me think of the preeminent bassist Ray Brown. Sometimes you'll hear Jim Hall play in this style to imply a half time feel.